The MCC series is suggested as an alternative to open cooling circuits with heat exchangers, where the cooling liquid (water or water and glycol) cannot be polluted by external agents. With MCC you can work in free cooling: the fluid circulates inside a tube evaporator coil. – Axial motor-fan with direct coupling, low installed power, low noise levels. – Motors with IP56 protection. – Tower body made of 22 mm thick fibreglass sandwich panels. – Support structure in hot dip galvanized steel after fabrication (galvanization process in accordance with UNI EN ISO 1461-99 standard, thickness not inferior to 80 microns). – Distribution system in PVC equipped with wide non-clogging PP spray nozzles. – Certified PP drift eliminators (entrainment 0.01%). – Heat exchanger coils made of smooth tubes in hot dip galvanized steel after fabrication. – Tank with sloping base entirely made of fibreglass. 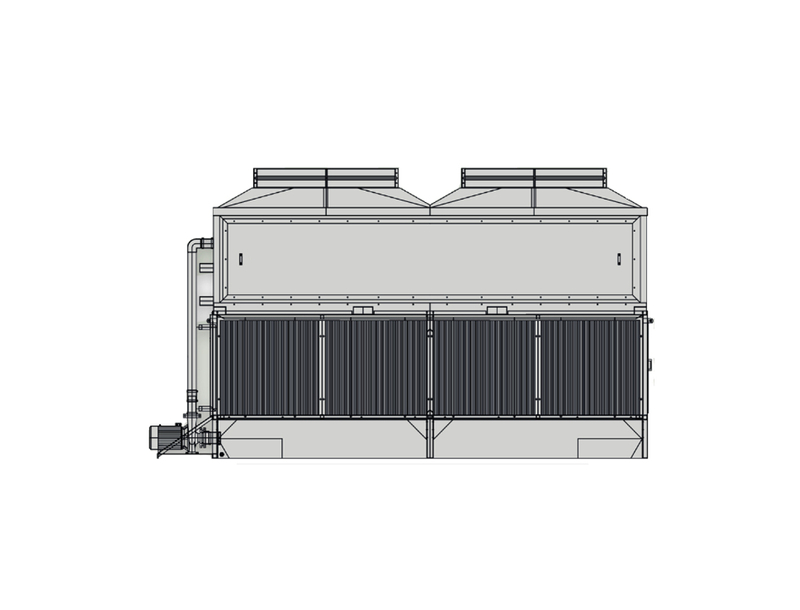 – Capacity: from 80 kW to 1.7MW (indicative capacity referring to a machine, thermal gradient 5°C). • Cooling of delicate equipment such as air compressors, moulds and plastic extrusion machines, pipe-manufacturing (using an emulsion with anti-corrosion additive in the closed circuit water) or induction furnaces (with demineralised water). • Civil and industrial air conditioning installations. • Refrigerated warehouses (e.g. storage of food products). • Coil in AISI 304 or AISI-316 (for corrosive water spraying and/or aggressive environment, for semi-open circuits or for cooling circuits with demineralized water), available only for the MCC Series. • Double pass coils with separated collectors to maximize thermal performance. • 2 speed motors with multistage thermostat (or an automatic centralized cascade control or a control system with frequency converter). • “Silent” version characterized by its reduced noise emissions. • Electric heater with thermostat and switch for minimum level in the basin. • Man-sized access door to allow access to the inner parts for inspection work, cleaning or maintenance. HBR series is able to operate in evaporative (wet) or dry (dry) mode depending on the external temperature or the fluid to be cooled. HBR is a hybrid system designed to reduce water consumption and/or energy consumption. – Finned coils made of copper and aluminium. 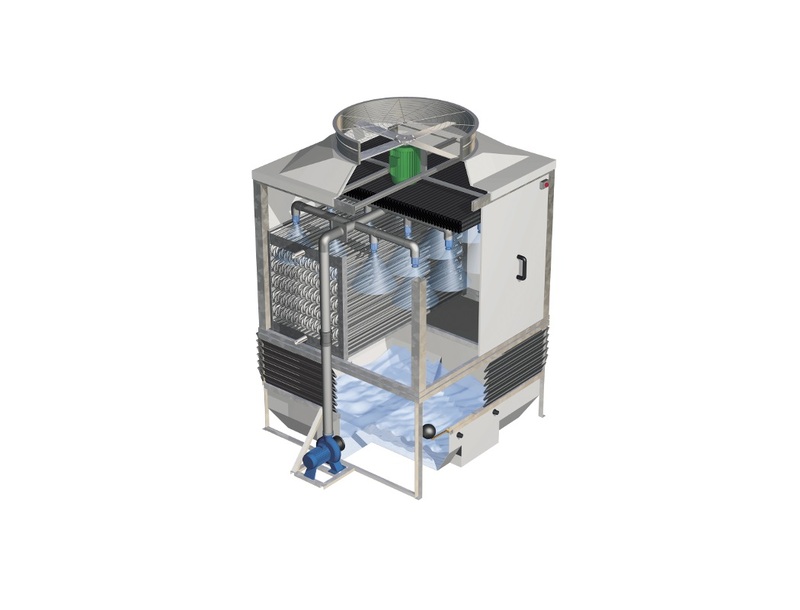 • Unique design on the market (European Patent pending) Peculiar geometry and parallel position of the two heat exchangers; one or more reversible ventilators; gravity aluminium overpressure dampers. HBR is designed in order to consume the bare minimum. Within the space of a year it exploits the most appropriate cooling method depending on the different climatic conditions. The fluid flows inside the smooth tubes heat exchanger and it is cooled by evaporation. The finned tubes’ coils are in stand-by and they are located outside the saturated air flow, sucked by the ventilators. The fluid flows inside the finned tubes heat exchangers and it is cooled by air. The smooth tube’s coil is in stand-by and it is outside the warm air flow pushed by the ventilators. Only the necessary energy for the air circulation through the finned coils is consumed. In both cases the air flow is not influenced by the stand-by heat exchanger presence and the pressure drop is reduced. The system is electronically controlled by a PLC. It can be supplied pre-wired on the unit’s side (in the factory), or it can be provided by the customer. Naturally corrosion-free materials and resistant over time. Several solutions to simplify the access to the internal components; easy and total access to the coils. Several technical solutions to reduce the noise levels measured and calculated in accordance with ISO 3744 and EN 13487 standards.